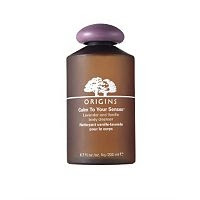 Recently I stumbled on a fabulous body wash. I`m talking about Calm to your senses by Origins, a lavender and vanilla body cleanser. Can you imagine vanilla and lavender mixed together? It`s heaven! While lavender makes you feel loved and cozy, vanilla relaxes and relieves. It also contains cleansers from coconut oil to form a creamy lather. I really puts me in a great mood to start the day. Wouldn`t you like to feel like this every day? Need a new body scrub?